Erin Hamilton received her degree in Sociology from the University of Texas, Austin in 2009. Her current research investigates the social and demographic sources of international migration from Mexico to the United States. More specifically, she focuses issues related to socioeconomic development and demographic change in Mexico, and, in particular, when and why migration flows are domestically- or internationally-bound. Additionally, her current work examines the process of immigrant incorporation in the United States, looking specifically at access to health care and health outcomes within a framework of racial and ethnic inequality. This work attempts to understand whether, how, and why immigrant health changes over time in the United States, examining the roles of socioeconomic inequality and access to social services. A pesar de esfuerzos significativos para impedir la inmigración desautorizada, migración cíclica a los Estados Unidos después de deportación es común. En un nuevo estudio, mis coautores y yo examinamos como el tener una familia en los Estados Unidos afecta el intento a regresar entre migrantes deportados a El Salvador. Concluimos que el separarse de la familia en los Estados Unidos es el factor más importante que se relaciona con el intento de regresar, aunque haya sanciones severas si son capturados. 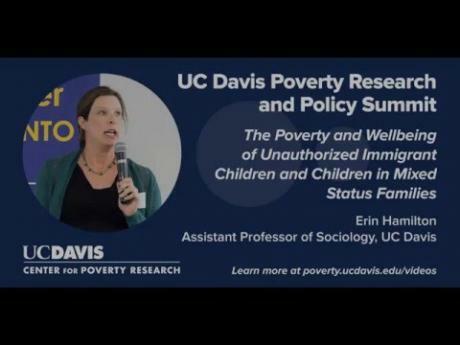 In this presentation, UC Davis sociologist Erin Hamilton discusses how being unauthorized or living in a mixed-status family where at least one member is unauthorized affects the wellbeing and incorporation of children of immigrants. Deportees Will Risk Harsh Penalties to Return to Families in the U.S. Despite significant efforts to deter unauthorized immigration, repeat migration to the United States following deportation is common. In a new study, my co-authors and I examined how having family in the U.S. affects the intent to return among migrants deported to El Salvador. We found that being separated from their families in the U.S. is the most important factor in the intent to return, even despite the severe penalties if caught. Deported parents face no good solutions to the dilemma of forced separation from their children: Either they remove their children from their country of citizenship, or deportees return to rejoin their children, facing harsh penalties if caught. Many in Houston regularly face the terrible prospect. One in five children in the United States is the child of immigrants. These new Americans, most of whom are U.S. citizens, are more than twice as likely as children of natives to have no health insurance. Prior research has shown that differences in income or employment between native and immigrant parents do not account for the disparity in coverage. Children of immigrants currently make up one in four of all children in the United States, and this proportion is expected to increase to one-third by 2050. On average, children of immigrants are more likely than children of natives to live in poverty, experience food insecurity, and live in crowded housing. Additionally, they are less likely than children of natives to receive public assistance or to have health insurance. In this project, investigators provide a comprehensive picture of the health of children of immigrants in comparison to children of natives using recent, nationally representative data. This project, funded through the Center for Poverty Research Graduate Student Fellowship Program, examines whether differences in state implementation of the Children’s Health Insurance Program (CHIP) affects disparities in health care between children of immigrants and children of natives.